What is an object beyond its physical state of being? What is its value, and how can its purpose, function, and objectness change depending on how it is constructed economically and socially? Conrad Bakker’s Untitled Projects investigate these questions and explore how objects function beyond their immediate visual and physical state of being. Bakker creates hand-carved and painted sculptures of objects from the everyday and presents these works in consumer contexts, markets of exchange, and gallery spaces. 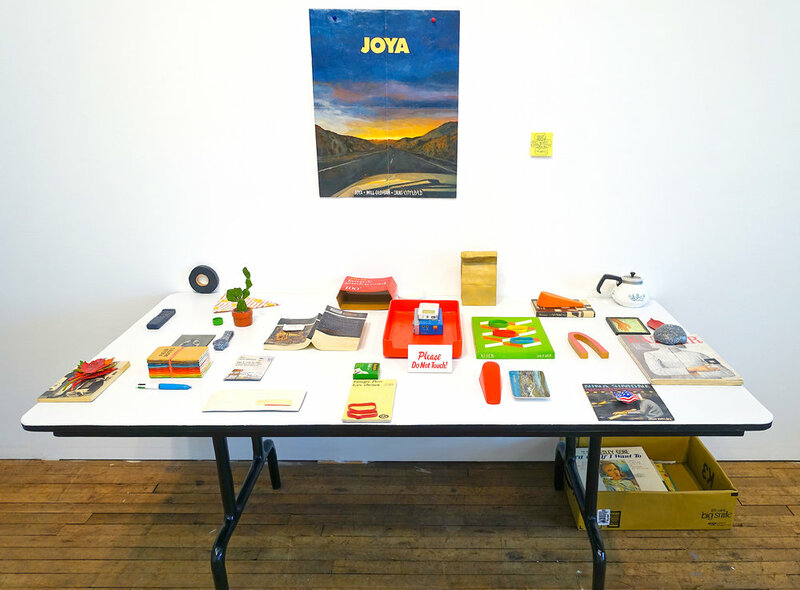 Shifting the interactive and economic space for these objects allows viewers to directly question how objects function in terms of value and socio-cultural capital. In his current ongoing project, Robert Smithson Library and Book Club, hundreds of books have been carved from wood and painted in oil reflecting realistic representations of every book from the late artist, Robert Smithson’s real library. On the one hand, the project celebrates the artist’s intellectual and artistic pursuits and interests, presenting a visual representation of a man’s collection of knowledge. On the other hand, the book club engages with the notion of a material collection things, thinking about an object’s value as something to be collected and something that then becomes a representative archive of an individual. Grounding these explorations within an online library where people are able to reserve and check out books for a small registration fee, Bakker ties these conceptual explorations within actual an actual system of exchange. Such is emblematic of Bakker’s work and practice, a vast oeuvre that explores painting, object-hood, and ideas of value. From an installation of a record shop filled with carved and painted sculptures of vintage records, to a series of sculptures and paintings depicting mineral rocks in the hands of their owners, sourced from online auction images, to a 1:1 scaled carved and painted sculpture of a 1964 Honda CB77 Superhawk motorcycle -- Bakker’s work is extensively researched and produced, and is completely connected to constructed networks of value, content, knowledge, exchange, and ownership. Throughout all of Bakker’s work weaves an interest in reproduction and consumption. Using platforms such as eBay, Craigslist, garage sales, and personal trades, Bakker’s work is fully invested not just in creating an object itself, but investigating how that thing can operate and function within our reality and attain a life of its own. Conrad Bakker was born in Clinton, Ontario, Canada, receiving his BFA at Calvin College and his MFA from Washington University in St. Louis. Bakker’s work has been exhibited nationally and internationally at Tate Modern (London), Galerie Analix Forever (Geneva), Fargfabriken Center for Contemporary Art and Architecture (Stockholm), and the New Museum of Contemporary Art (New York), to name only a few. Bakker’s work has been written about in publications including Art World Magazine, Frieze, ART PAPERS, The New York Times, Contemporary, The Chicago Tribune, Artforum, Sculpture, Dwell, and The New Yorker magazine. He has been awarded grants by the Joan Mitchell Foundation, the Illinois Arts Council, and the Creative Capital Foundation. He currently lives and works in Urbana, Illinois, USA, where he is currently a Professor and the MFA Studio Program Coordinator for the School of Art and Design at the University of Illinois in Urbana-Champaign. 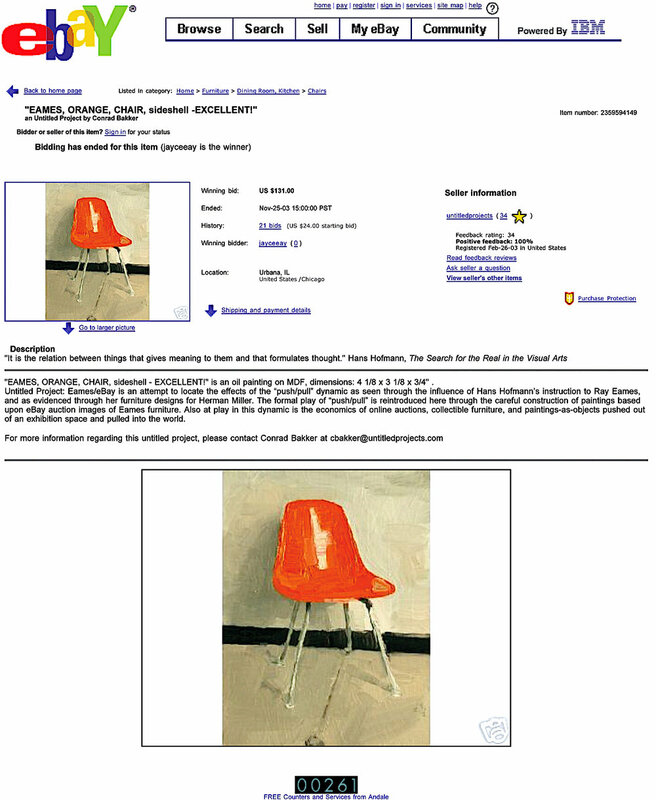 A series of scaled paintings of eBay auction images of vintage Herman Miller Eames shell chairs. 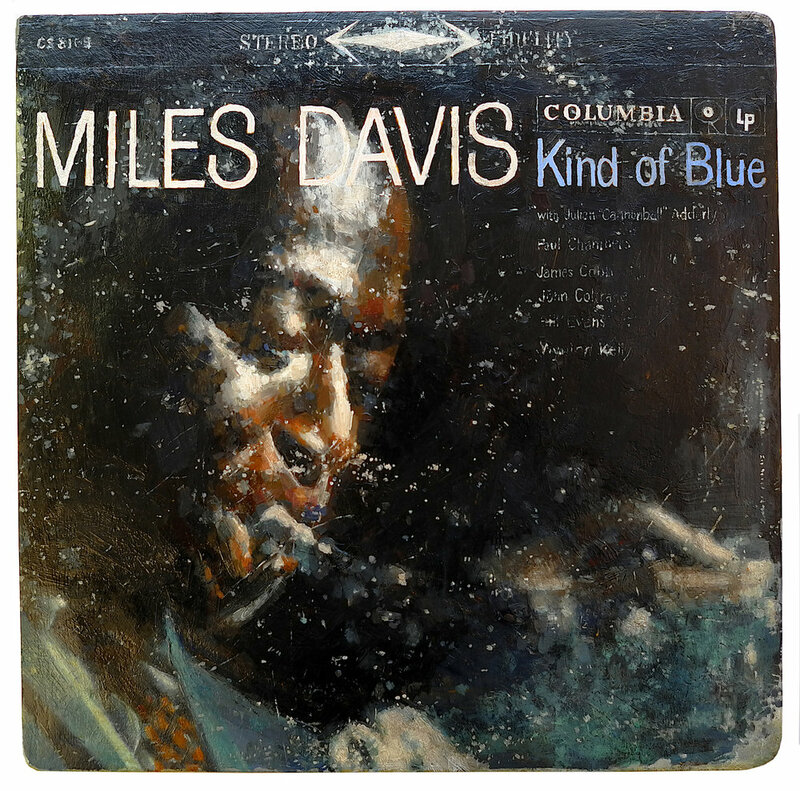 The paintings were titled and priced according to their original eBay auction and were then placed back onto eBay in their originating category and sold to the highest bidder. This project pointed to the formal push/pull of color and shape in eBay auction photographs of Charles and Ray Eames’ vintage furniture, specifically referencing Hans Hofmann’s influence on Ray Eames. What is your background in art, and how did you start making work and arrive at your current body of work? When I became an art major in college, I didn’t really know what it meant to be an artist, so I was leaning towards something more design oriented that also had the outcome of an actual job and a salary. But I realized that I liked making things regardless of whether or not there would be a client, and I wanted to make things based upon my own research and interests. What I remember most about this time is that the art studio became the place where a lot of my learning came together. I took a couple of years off after college and then in graduate school I went through a material and philosophical shift in my work and process. I was trying to make paintings occupy space in a way that was somewhat literal, a shift from a flat plane to an installation space that included found and painted objects along with images. Eventually there was a shift from using found and manipulated objects to constructing the object completely and then painting it to look like the real thing. For a while I was setting up the constructed and painted objects in theatrical arrangements that suggested absent characters in a specific narrative. While these fictions were interesting to me, they felt limited by their theatricality, so I began exploring ways to make objects and installations that could infiltrate the world more directly and perhaps function within the larger narrative of the everyday. Could you expand on how you think about narratives in relation to your work? In my earlier work, the narratives were constructed out of objects arranged in space, and it was like walking into a room and making sense of the story based on the things that were left behind. I would then use that narrative structure to get to a conceptual space. A major shift happened when I did the garage sale installation. Initially I was thinking of the garage sale as an autobiography of objects in the way persons and stories are revealed by the things that they have owned, a narrative constructed out of a specific collection of things or a set of habits. But I also became interested in the garage sale as a consumer space where, under the guise of a transaction (or potential for a transaction), there is a narrative of negotiation, a sharing of stories. The transaction thing also opened up a wider audience for this work in a way that I hadn’t anticipated, which allowed me to see how affordability could be linked to accessibility. A site-specific garage sale installation that featured over one hundred carved and painted copies of domestic objects situated on hand-carved desks and tables on a residential front lawn in Grand Rapids, Michigan. Open to the public from 10am to 4pm on Saturday, October 11, 1997, this simulated garage sale attracted the attention of art viewers, garage salers, and a few buyers. Economic exchange is very present in your work, especially through the platforms that you engage with, such as eBay, craigslist, personal trading. How did you first start utilizing these platforms? After the garage sale project I produced the Untitled Mail Order Catalog project, which allowed me to continue to think more about consumer objects and spaces. At this time (the early 2000’s) eBay was an extremely active consumer space and a perfect site for a number of my projects. I was attracted to the uses of narratives by eBay sellers and how personal stories are part of many of these transactions. I was also struck by the relationship between images and objects––how authenticity was represented effectively through amateur photography that included things like eBay seller’s hands, fingers, pennies or rulers, all to make the thing that was for sale feel more real. Perhaps this was a natural response, an overcompensation for the abstractions and fragmentations of the Internet. My eBay projects also led into researching other online spaces where things were exchanged, and Craigslist became an obvious site to explore as it was an active location for the online bartering of goods. Like in the other online projects, I quickly focused on the narrative structures at play in these exchanges, in particular the way personal, emotional, or whatever subjective values became part of an economic exchange. A fully functional mail-order catalog mailed to more than 4000 addresses, featuring carved and painted sculptures of designer objects, priced equivalent to their originals. All of the catalog objects were constructed by hand and all aspects of labor—from answering the toll-free phone number to the product shipping and handling–were intentionally handled by myself and contingent on my time and availability. Your work engages with these economic spaces of exchange, yet also functions as an art object within the art world and operates in relation to those constructed values. How do you approach thinking about those spaces in relation to one another and how your art operates across them? I’ve tended to engage a wide range of contexts for my projects because I think all of the conversations are interesting. Even though it’s true that once an art object enters the museum space it becomes more regulated and policed, within these institutional contexts there are still some really interesting things that are happening. I like thinking about how an object in a museum might be considered similarly to an object on eBay, since both objects exist in strange transactional spaces of observation and evaluation. I like thinking about how art collectors are not really that different from anyone who collects things. An art collector’s interest in and specialized understanding of what they are collecting is usually part of a larger discourse and community and ultimately not that different from someone collecting mundane objects like toasters or teacups. Bringing this back to eBay, I have discovered that online auction and exchange sites like eBay have generated and sustained specific communities of buyers and sellers who participate in their own specialized discourse about specific things. Through my various eBay projects I have encountered many of these communities, from fanatics of muscle cars to people who collect tupperware, and I have enjoyed participating in these specialized conversations. All of this has led me to consider the commercial art gallery as just one of many viable contexts for my projects. Produced specifically for the exhibition Living with Duchamp organized by Ian Berry for the Tang Teaching Museum, this project featured twelve carved and painted sets of Tupperware measuring cups, each set arranged according to specific presentation patterns of Tupperware eBay auction images. Over the course of the exhibition, the measuring cup sculptures were put up for auction on eBay in the vintage Tupperware category with starting prices and titles based on actual eBay auctions. As the sets were sold the museum staff removed the sculpture from the exhibition and shipped the objects to the highest bidder––and in the objects’ place, the museum posted a printout of the eBay transaction. How do you approach selecting what type of object to make? Can you talk more about your creative process and the development of a piece? A lot of it just happens by paying attention to the things around me that are part of my everyday and finding connective threads between these things and my research interests. For example, I’ve recently been reading and drawing from industrial supply catalogues and I am interested in the way they are using clip art, their own specific stock images, to stage their consumer goods, all of which becomes a strange almanac of the industrial business world. I also do a lot of looking at the world through the Internet to locate interesting patterns and habits. 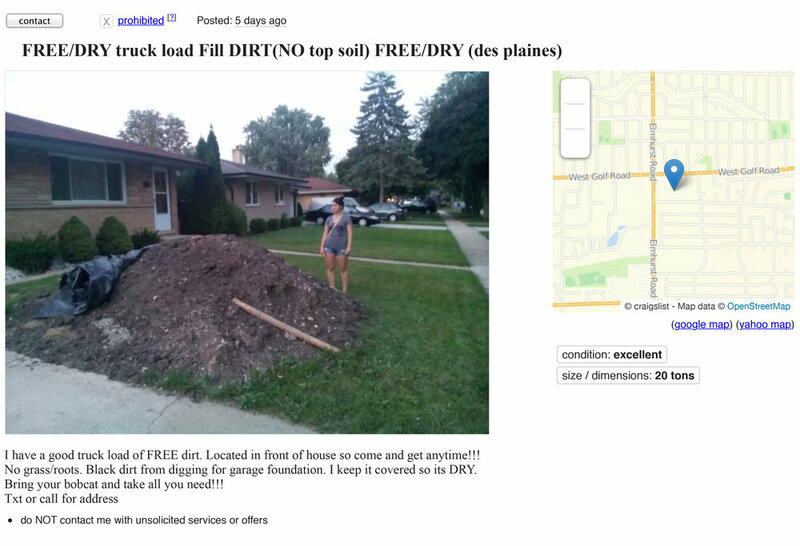 I currently have research project where I’ve been collecting images of ‘free dirt’ on Craigslist, which are literally images of piles of dirt in urban and suburban contexts from the midwest and all over North America. I’m interested in how these piles of free material affect an understanding of our domestic landscapes. I should probably add that this research has not yet turned into a project and might not even become anything. My process is also connected to research based on site-specificity, whether that be a particular geography, institution, or history. Oftentimes when I am invited to be part of an exhibition, it is much more rewarding for me to propose making something new related to the site rather than recycle past projects. Ideally, these site-specific projects emerge from my ongoing studio research, things that I’m interested in, and what might work in the provided context. One example of this way of working is in my recent project remaking Thoreau’s cabin. I’ve been interested in Thoreau for a long time and I always wanted to do a project about him and his cabin. I remember visiting Walden Pond years ago and paying close attention to how tourists engaged with the official replica of his cabin in such a way that made it seem more than just a theatrical prop–it was a prop that functioned in a real and really strange way. 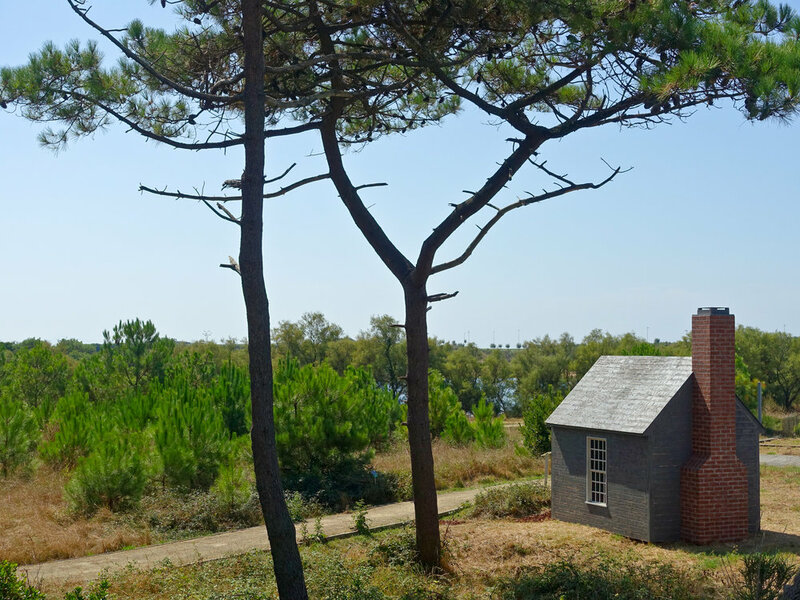 When I was approached to be a part of the Anglet Biennial, a temporary sculpture exhibition in southern France, I immediately started thinking about the replica of Thoreau’s cabin at Walden Pond and proposed and eventually built a carved and painted sculpture based on the replica on the edge of a large pond in an ecological park in Anglet. Of course my sculpture of the cabin cannot be entered as it is all facade, and it is geographically and historically displaced, but in this case I like how that facade and displacement becomes foregrounded as part of the content of the project, a push and pull between the real and the artificial and the idealized. A carved and painted replica of Henry David Thoreau’s cabin at Walden Pond near Concord, Massachusetts. This cabin-as-object is intended to function as a sincere/unsatisfactory object providing a critical commentary on the theatre of nature and the commodification of self-reliance––all of which is useful for considering one’s place in the natural world. This project was sited specifically on the shore of Lac Nord of Izadia Ecological Park in Anglet, France for La Littorale #6, Biennale Internationale D’Art Contemporain Anglet-Côte Basque curated by Paul Ardenne. Can you talk also about your material process? How did you arrive at making all of these works out of wood? When I first started making sculptures of everyday things, I was using several different materials including wood, paper, styrofoam and canvas, really only because this was what was available to me. I realized that these different supports were becoming distracting to the content of the work. Making everything out of one material, wood, became an easy way to focus the conversation because when everything on view is constructed out of wood, the attention goes more quickly to the issues of representation and function. Carving wood was also another way of thinking about surface and space and detail, like in painting. There’s a certain level of finish that doesn’t happen in my process because I’m not trying to achieve a photographic realism. Instead, I’m more interested in the object falling apart, becoming clumsy at a certain point in its reception. The carving and the painting process changes the resolution as it becomes more pixelated and breaks down. This moment is really interesting to me because it’s both a moment of engagement and decision making for the viewer to move on or play along. I like the questions that emerge in the double take. If it looks like the thing and holds space like the thing, but is not actually the thing, then what is it? How does it function? What does it mean? Why was it made? A lot of this relates to a larger conversation about art and artifice and that representations might benefit from showing their seams and revealing the mechanics of making a representation. Perhaps an example of this is when the construction of something precious is represented at a lower resolution it has the potential to make that precious thing strange and less attainable because of how fragmented it becomes as the closer one gets to it. A carved/painted sculpture of a 1964 Honda CB77 Superhawk motorcycle at 1:1 scale. The Honda CB77 Superhawk is known for its speed, power and reliability and in many ways set the paradigm for modern motorcycles. This particular motorcycle also has a specific literary connection––to the 1970’s best selling novel Zen and the Art of Motorcycle Maintenance. A significant part of this project is embedded in its conflation of construction-as-maintenance as part of a dialectical motion, connecting labor to material to economies—a complex gathering of a self in the world. How do you go about constructing them and carving them? What is that planning out process like? I guess it depends on the thing I am making. Most of the time when I am making something, I don’t have the real object sitting in front of me as a model. I rely more on two-dimensional printed images of the object that show multiple perspectives. 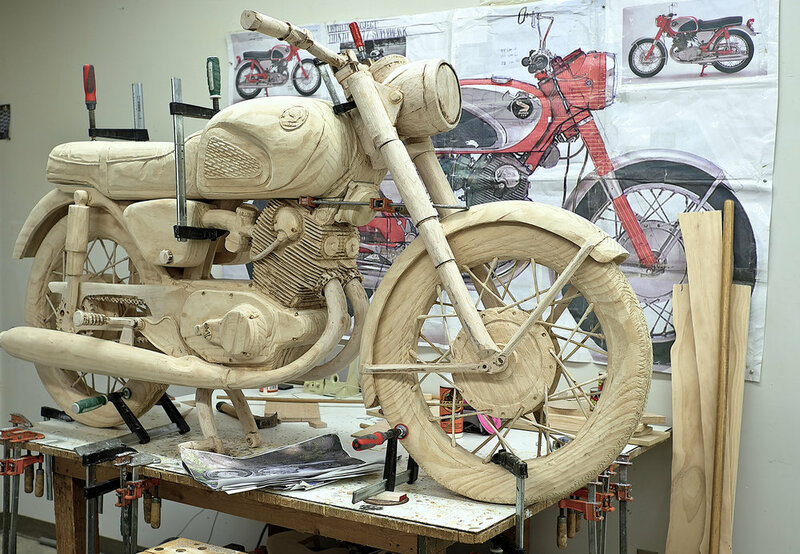 For instance the carved and painted motorcycle from Untitled Project: Honda CB77 Superhawk was constructed using hundreds of images from online sources. At the very beginning of that project, I printed out a 1:1 scale side view of the motorcycle that was like a map for making every part of the sculpture. I have found that the distance between me and the actual thing that happens from working from images has become an important part of the process and the outcome. On a very practical level, my sculptural process first involves drawing and measuring, then I laminate pieces of wood together to make the rough three dimensional form, then I carve with disc grinders and dremel tools. There is a lot of trial and error-- sometimes I have to make an object multiple times just to figure out how to do it right. All of this is to say that while I am interested in craft issues, my sculptural work is slightly higher than rudimentary carpentry and not really something that might be valued in a context like American Woodworking Magazine. There’s a project that I’ve been doing for a while called Untitled Project: Anything You Want where anyone can propose a specific thing that they want and if it meets the right criteria, I will then make a carved and painted sculpture of that thing. This might be a thing they wanted to own but couldn’t afford, a thing they might have lost, or simply a favorite thing worthy of duplication. In the proposal process of this project there is a back and forth negotiation between myself and the participant about the thing, which includes their reasons for wanting it and my ability and/or interest in making it. In the end, the carved and painted copy of the thing functions as both a replacement and a reminder––a placeholder that points to both an attempt at fulfilling their desire for the object and an awkward monument to an absence, a failure. How do you approach that specific project and how did it start? In terms of a transaction, is something given in exchange for those works? Untitled Project: Any Thing You Want started in part from situations where I was making a commissioned artwork for a collector or trading artwork with other artists, and noticing that the collectors and artists were rather specific and prescriptive about the thing they wanted. Another part of this project came out of the regular suggestions I get from my family, friends, and strangers as to the next thing I should try to make out of wood and paint. I suppose still another part of this project comes out of a challenge to rethink both the relationship and scale of the artist and viewer by focusing on the production of a single work for a single person. Regarding the transaction and exchange, the terms are established through a series of direct conversations with the potential participant and range from cash payments to bartering of artworks and/or other goods and services. Books are objects that I see appearing in a lot of your work, particularly with your library project. Can you talk about your interest in the reproduction of books and how that library project came about? 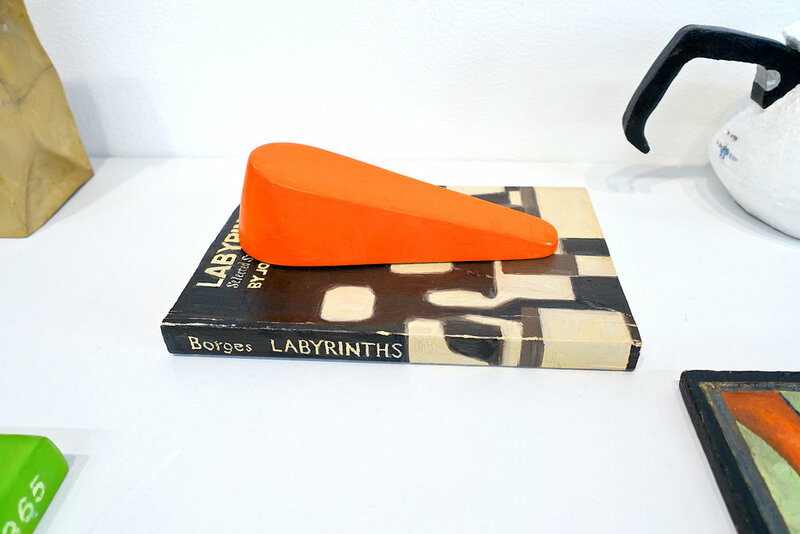 I’ve made books as sculptures for a while. Early on they were simply based on interesting books that I’ve owned or wanted, but then I started thinking about books as collections and what these collections of books might represent as a whole. 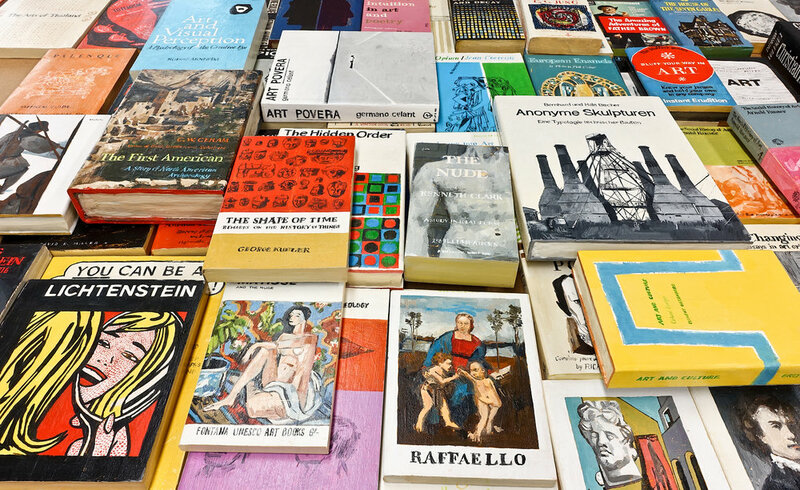 One of the first book projects was a bookshop in Switzerland (Untitled Project: Librairie [Geneva]) where I constructed, displayed, and sold hundreds of vintage paperback books from the 1960s and 1970s in a storefront space that was also a contemporary art gallery. This time period was chosen because of the specific design and subject matter of these decades, but also because it was during this time that paperback books functioned something like a physical Internet, a collection of ideas in cheap and portable containers. Of course books can still function this way, but the Internet has taken over the transfer of ideas. There were a few other book projects after the Librairie including a used-book sale table at the Printed Matter Art Book Fair, a book-of-the-month club, and a series of freely distributed self-help books. The Robert Smithson Library and Book Club project grew out of the earlier book projects, my personal interest in Robert Smithson and his work, and an invitation to produce a solo exhibition at the Utah Museum of Fine Arts in Salt Lake City. When Robert Smithson died in a plane crash in 1973 all of his books were listed, boxed and eventually placed in the Archives of American Art. My encounter with this library has only been through the list of books which has been printed in a number of monographs and critical texts about Robert Smithson. The inaccessibility of the physical collection of books is really interesting to me. If one wants to see Robert Smithson’s actual books they would have to go in person to the Archives of American Art, but even then they would have to know exactly what they wanted and the experience would entail going through one box of books at a time. 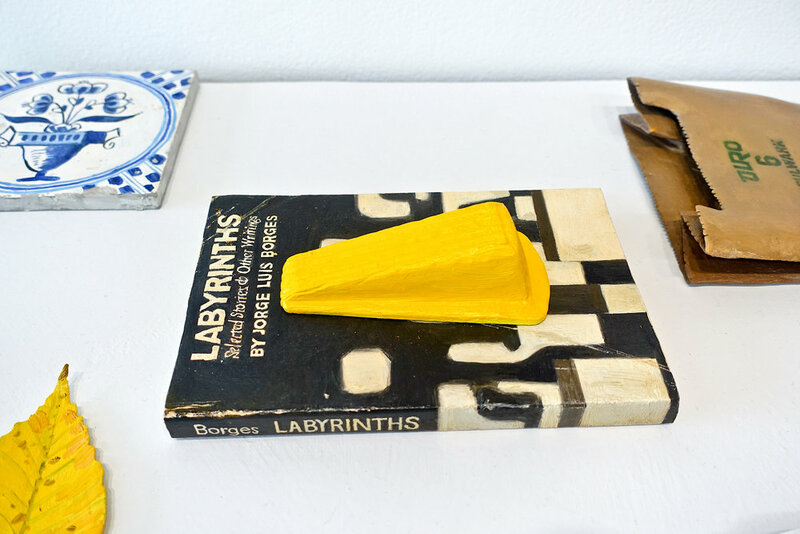 In a way, the collection of carved and painted books I am producing will function like a surrogate library, a physical experience of all of Robert Smithson’s books in one room. I would like to think that one of the reasons that Robert Smithson’s library was archived in the first place was because of the way this collection of books represent his thinking and his engagement with the world. The titles point to a wide array of subjects that range from science to science fiction, from philosophy to religion, from geology to astronomy. It is impossible to really know Smithson’s relationship to every book listed in his library, but these titles still have the ability to inform our understanding of Robert Smithson and his work. I’m also interested in the series of science fiction DVD’s you made. Can you talk about that project and those types of objects? That project was site-specific commission for one of the public spaces in the Institute of Genomic Biology on the campus of the University of Illinois where I teach. The IGB is primarily a laboratory that is only accessible to scientists and researchers. The public spaces are merely a series of small lobbies that emphasizes the barrier between scientific research and the public--what happens behind the laboratory doors is often left to the imagination or conjecture. I was interested in this and also the way that the general public indirectly understands and contextualizes science through science fiction. So I produced a series of carved and painted science fiction DVD’s, specifically films that have a connection to genetic science, and installed them on a set of shelves for one of the public lobby spaces, almost like a display wall in a video rental store. This project had an interesting reception in that it was loved by science fiction enthusiasts but not so loved by a few of the resident scientists who thought this depiction trivialized their profession. This relationship between science fiction and science in this project echoes some of the underlying concerns in a lot of my work about the blurred boundaries between what is fiction and what is real and how our understanding of one might sometimes require the persistence of the other. How do you approach and think about humor within your works? I’m interested in the role of humor and its relationship to accessibility. Humor creates an opening, an innocuous space that disarms and even provides access to a deeper engagement. I think in my work I would like there to be a small laugh as well as the moment when the laugh is caught in the throat. A reflection on things and their representations using the strategy of a still life to arrange a series of repetitions. 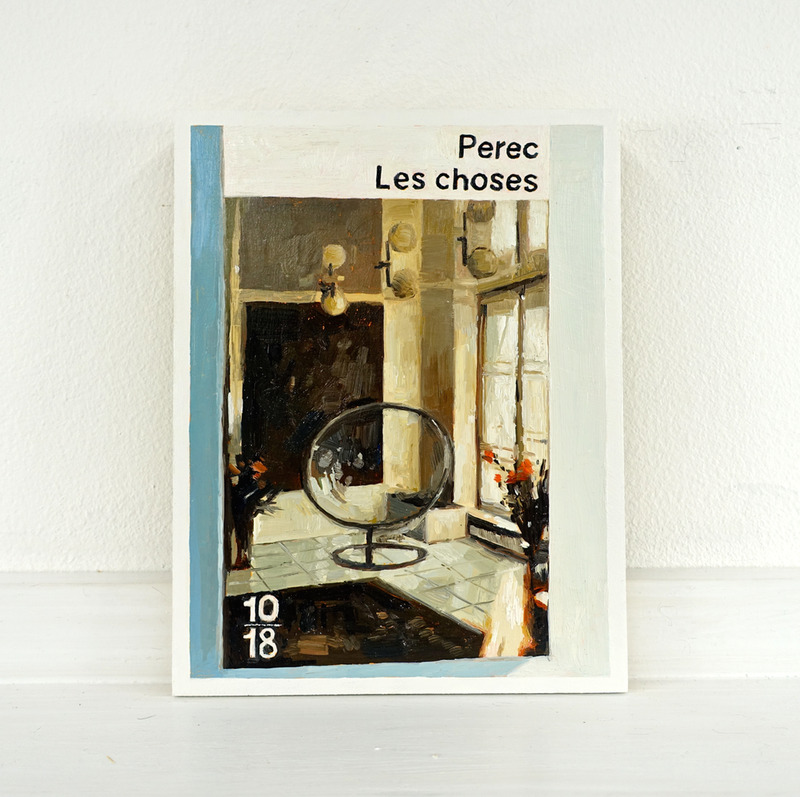 The title of this project is borrowed from Georges Perec’s brief essay Still Life /Style Leaf in which he describes the everyday objects on his writing desk and then repeats the task, literally describing his description and letting the differences separate the two events. Humor also has an interesting relationship to representation, like when something clumsily pretends to be something that it’s not, or when one thing is juxtaposed with another. Perhaps humor can even be considered an important formal strategy that is imbedded in the construction, the way that a form, shape, or color might become a visual gag, or the way that objects placed in connection to one another might spark a nonverbal joke. A subtle example of this might be seen in my a recent exhibition Untitled Project: Still Life Style Leaf. 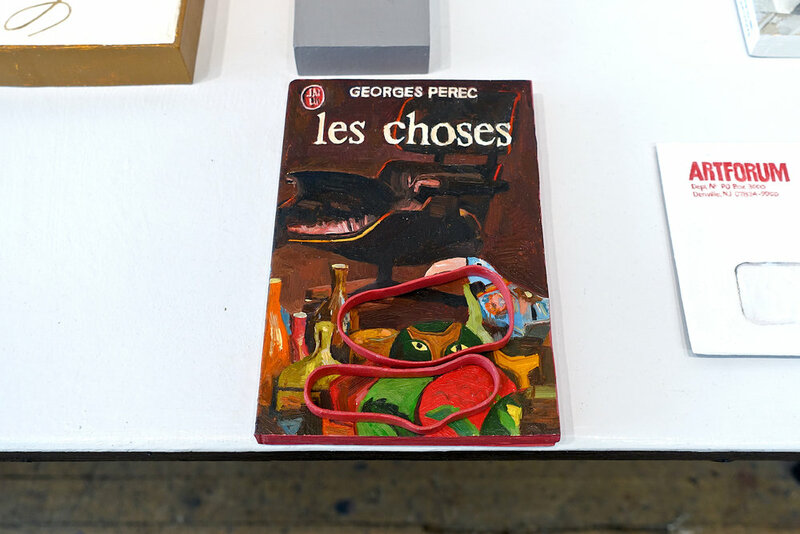 The title and subject of this project was taken from a George Perec essay, a peculiar text where he mechanically describes all the things on his desktop and then he repeats the task and describes what he just wrote about all the things on the desktop. It’s a repetition with subtle changes occurring between the first and second descriptions. My project involved making two sets of carved and painted sculptures based on a set of personal objects from my studio table that I had collected over the years and then presenting both collections of simulated objects in similar arrangements on opposite ends of the exhibition space. This project was a representation of repetition, a literal and figurative doubling leading to a double-take. As the viewer moved from one collection of carved and painted objects to the other, the similarities and differences between one object and its repeated other revealed themselves through formal play and humor. That reminds me of the dumpster piece you did, where the purpose of the dumpster is removed by it being a replication of the original, but also how that replication was mistaken for reality and then sometimes used as if it were a real dumpster. I have done a series of projects featuring carved and painted copies of everyday objects that attempt to function like the real thing as they blend into an institutional space. These are objects like donation boxes, security cameras, trash cans and dumpsters. One of the interesting things about Untitled Project: Dumpster was even though it was large and orange and set in the middle of a public plaza adjacent to an exhibition space, a number of viewers walked right past the sculpture on their way to the exhibition space and didn’t see it until it was pointed out to them. During its temporary stay, this sculpture collected trash, supported student art interventions, and earned a graffiti tag, which was eventually painted over by the City of Chicago graffiti removal program. In a similar project I made a two small carved and painted office trash bins to collect trash and debris for a group exhibition at the Hyde Art Center in Chicago. When I went to pick up the work at the end of the exhibition, the art center staff could only find one of the trash bins, the second bin was lost and presumably stolen. But then a year and a half later they called me to tell me that they had finally found the missing trash bin––the entire time it had been in use in the ladies restroom! 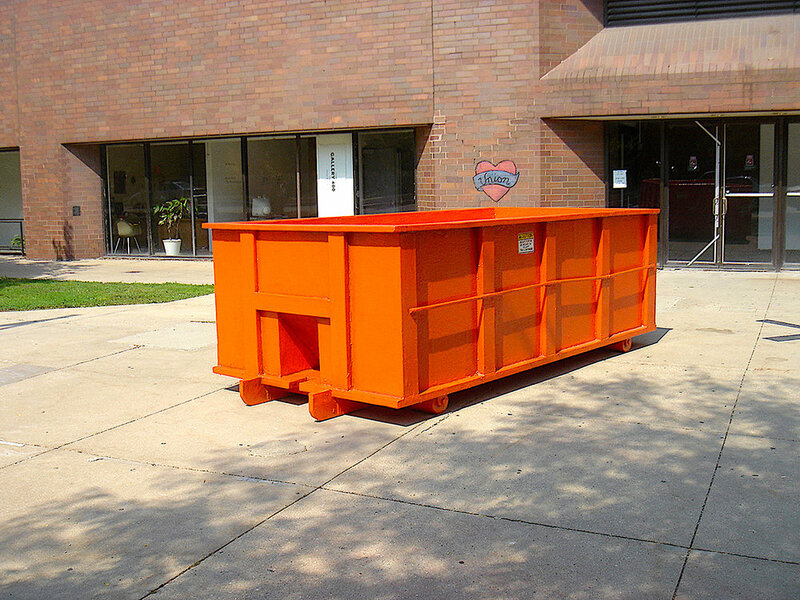 A carved and painted dumpster placed on the plaza in front of Gallery 400 at the University of Illinois at Chicago from September 2005 to February 2006. The dumpster sculpture functioned in many ways like a real dumpster in that it was both a visual symbol for construction/renovation/change and a platform for participation. During its brief stay, it collected trash, became a sifting site for recyclables, a support for student artworks and interventions, and a surface for graffiti–which in turn was painted over by the city of Chicago’s graffiti removal program. In the end the dumpster was emptied and delivered to Dan Peterman’s experimental station, which was then under (re)construction and needed a “dumpster” to comply with city code. At the moment I’m working to complete the Robert Smithson Library and Book Club project. I’ve shown it in its in progress state a few times already, but it’s not yet completed and so it is taking up most of my studio time and focus. I am looking forward to getting this project completed so it can be exhibited and also so I can start working on whatever is next. What is informing your work right now -- what are you thinking about the most right now? At the moment I am thinking a lot about social and political issues regarding privilege and power and not just because of our current political climate or recent police situations when power has been abused. This should be a matter of concern for all artists, but in particular for artists (like myself) who have benefited from institutional and cultural conditions that tend to automatically privilege those who are white, male, etc.. In the past I have tried to work through these issues in part by acknowledging my own complicity in these systems, but this is not always enough. I guess I am trying to deal with this now by paying attention to my own assumptions about how things are, what things mean, and how they are valued. I am trying to pay closer attention to the way I occupy space, questioning what I say and how I say it, and thinking carefully about the things I produce. Another issue that I am thinking about a lot right now is the relationship between materiality and politics, in particular about how the physicality of things might be useful for challenging the abstraction of ideas. I believe that artists who make things out of things learn to respect the inherent limitations of material and form, that working with and against resistant materials requires a careful negotiation and attentive understanding. I really think that traditional art objects like paintings and sculptures still have the ability to generate productive spaces for conversation and engaging with political issues. Perhaps this is to suggest that ultimately all politics is physical. How would you define a successful work? For me a successful work produces an experience that is visually and physically arresting, ideally something that challenges or even confounds an understanding of ourselves and our world. I like being surprised, unsettled, and convicted by art works. I think that this kind of experience doesn’t happen often enough and one reason might be that there are too many forces rewarding predictability. Perhaps another aspect of a successful work would be duration. Good artworks take time and give back an experience that expands, they resist reduction.